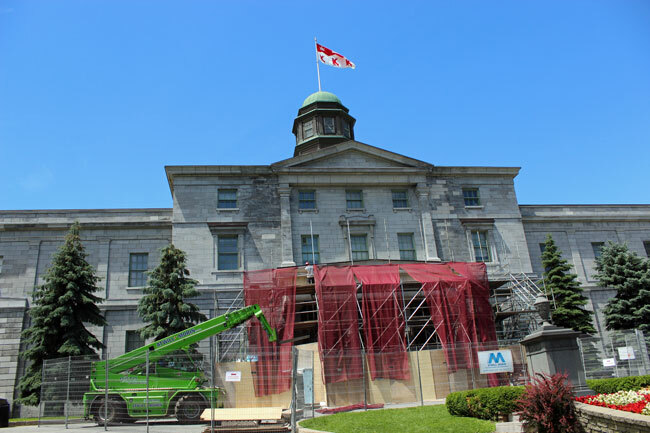 Repairs have begun to the iconic portico at the front entrance to the Arts Building. Scaffolding was erected Thursday, June 25, for a project expected to take between 3-5 months. Repairs have begun to the iconic portico at the front entrance to the Arts Building. Scaffolding was erected Thursday, June 25, for a project expected to take between 3-5 months at a cost of approximately $500,000. The portico has been supported by jacks for several months after inspections revealed cracks in the masonry had been growing larger and required attention. A screen depicting the portico had been put in place to give the appearance, at least from a distance, of the real thing. Dating from 1843, the Arts Building is the oldest building on campus, was designed in the Palladium Revival style of architecture, and was originally supposed to have a two-storey portico in front. An artist’s conception of this can be seen on a sign in front of the building explaining the need for the portico repair project. Because the larger, fancier portico was considered too expensive (just as the main and east wings of the building were nearing completion in 1843, the institution was running out of money), a temporary wooden structure was erected in 1860 and remained in place until 1926, when the current masonry version was constructed. “The University architect was John Ostell, who designed the central and east wings of the current Arts Building. He also designed the original campus layout, with a number of ornamental and kitchen gardens and the central lane. [Architecture Professor] Derek Drummond says that it was Ostell’s idea to keep the campus open to the city. “Financial constraints had an effect on the initial construction. A third floor was added to the central and east wings, while the west wing would not be built until the 1860s. The famous cupola was added to the plans mid-construction, while the halls connecting the central and east wings would have to wait for wealthier days. Both the main Arts Building and its east wing (Dawson Hall) were damaged in the early 1850s, when blasting for the new Montreal reservoir across from the rear of the buildings on what is now Dr. Penfield Ave. affected the foundations of both buildings as well as their roofs. The buildings were then abandoned for a time and classes were held elsewhere, according to MacKay L. Smith’s book, Memories and Profiles of McGill University.